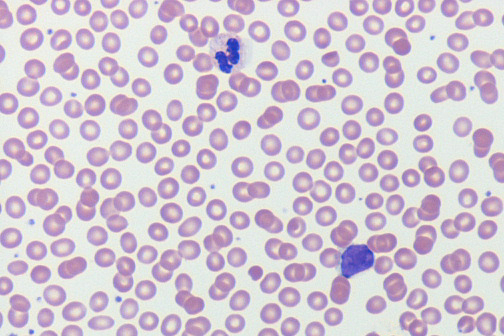 The peripheral blood smear shown here appears normal, because it is. A normal neutrophil and lymphocyte are present. Only a CBC will demonstrate anemia. This is a normochromic, normocytic anemia. Anemia of chronic cisease is the most common anemia in hospitalized persons. There is impaired utilization of iron, without either an absolute deficiency or an excess of iron. There is cytokine-mediated blockage in transfer of iron from the storage pool to the erythroid precursors in the bone marrow. The defect is either inability to free the iron from macrophages or to load it onto transferrin. Inflammatory cytokines also depress erythropoiesis, either from action on erythroid precursors or from erythropoietin levels proportionately too low for the degree of anemia. Inflammatory conditions release cytokines such as interleukins 1 and 6 (IL1, IL6) that stimulate hepatic production of hepcidin, which reduces iron absorption and decreases release of iron from stores in macrophages. The result is decreased total serum iron, but iron binding capacity is reduced as well, resulting in a somewhat decreased saturation, but increased ferritin. Serum soluble transferrin receptors will be unaffected by chronic disease states. Anemia of chronic disease is addressed by treating the underlying condition. Question: What diseases may lead to anemia of chronic disease? Answer Chronic infections, ongoing inflammatory conditions (e.g., inflammatory bowel diseases, vasculitides), autoimmune diseases, and malignant neoplasms are some of the underlying conditions with ACD.